At this year’s SEMA show, Motor Trend’s Angus McKenzie sat down with Peter Tarach (Modified Magazine), Jonathan Wong (Super Street Magazine) and Charles Trieu (Import Tuner Magazine) to discuss their uniquely modified Chevrolet Sonics on display. Tarach went for the performance minded approach, widening the cars stance, adding fender flares, Volk race wheels with sticky tires, exhaust, cold air intake and a tune. Trieu opted for a four door LT model, lowering the car, adding retro style wheels, a body kit, an intercooler, downpipe, exhaust and more. Finally, Wong took the technological approach and focused on the cars entertainment systems. Super Street turned their Sonic RS into a wi-fi hot spot and put a DJ booth in the trunk, but not before adding some rims and airbag suspension. 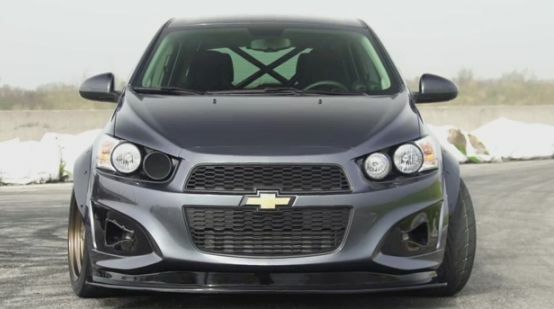 We haven’t seen many tuned Sonics around, so maybe this will show people the Chevy subcompact isn’t a bad platform for modifying, even if the guys had some trouble extracting more than an extra 50 horsepower out of the little 1.4 liter. Check out the interview in the video below. This is not a bad looking car except for the hydrous front grill. Anyone else agree that the front grill is an eyesore? With that said, the blacked out chrome is a major improvement and works well with eye-like headlights. I also like the chrome blacked out on the bow tie.